CITY OF SAN FERNANDO -- The strict implementation of “Oplan Katok” in the province resulted to the confiscation of hundreds of loose firearms of various caliber for police’s safekeeping. 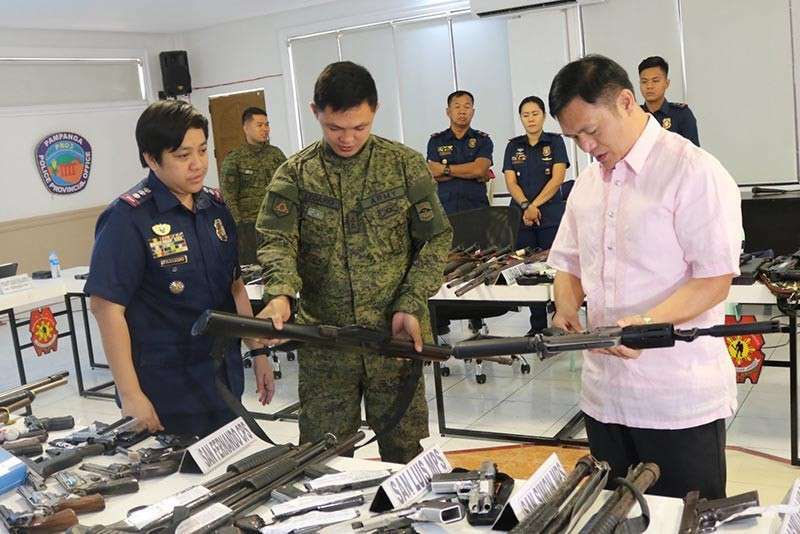 Senior Superintendent Jean Fajardo, Pampanga Provincial Police Office (PPPO) director, on Wednesday, January 30, led the presentation of the 202 loose firearms which were either voluntarily surrendered or confiscated during the implementation of “Oplan Katok” across the province. Oplan Katok is a Philippine National Police program wherein authorities go house-to-house to visit firearm holders who have not renewed their firearms license yet, and confiscate the firearms pending license renewal. “The headquarters downloaded the list of gun owners in the province who failed to renew their firearms yet, and then we will literally knock on their houses to inform them of the need to surrender their firearms until such time they will secure a new license,” Fajardo said. Among the list of recovered loose firearms by city and municipal police stations were 104 pistols, 18 revolvers, 22 rifles, 26 shotguns, one lightweight firearm, and two gun barrels. Fajardo said that the recovered firearms will also be subjected to cross-matching and forensics examinations to check if they were used in illegal activities or criminalities. Meanwhile, Fajardo said that she is looking into conducting a province-wide caravan for renewal of firearms license to cater to Kapampangans who are yet to process the documents of their firearms. “Instead of going to Camp Crame just to renew their licenses, we will extend it here to ease the hassle for gun owners. It will also be a form of encouragement to them to renew the registration of their firearms in time,” she said.